Low-fat or air fryers surround food with hot air so you can cook with little or no oil. The result should be food that’s crisp on the outside without the added kilojoules of deep-frying. We put air fryers to the test cooking thick-cut fries, skinny french fries and crumbed chicken. Snapshot: The EasyCook 11L Deluxe 727 Turbo Compact Health Oven has a capacity of 11L. How well does it cook fries and crumbed chicken? Snapshot: The Kogan 12L Multi-Function Air Fryer KAMLTIAIRFRA has a capacity of 12L. How well does it cook fries and crumbed chicken? Snapshot: The Tefal Actifry Express 1.2kg FZ7500 has a capacity of 1200g. How well does it cook fries and crumbed chicken? Snapshot: The Kambrook Air Chef Air Frying Oven KAF200WHT has a capacity of 2500g. How well does it cook fries and crumbed chicken? Snapshot: The Philips Air Fryer Viva HD9220/20 has a capacity of 800g. How well does it cook fries and crumbed chicken? Snapshot: The Taste the Difference Air Roaster has a capacity of 10L. How well does it cook fries and crumbed chicken? Snapshot: The Philips Avance Collection Airfryer XL HD9240/30 has a capacity of 1200g. How well does it cook fries and crumbed chicken? Snapshot: The Philips Daily Collection Airfryer HD9216/81 has a capacity of 800g. How well does it cook fries and crumbed chicken? Snapshot: The Sunbeam Halo+ DuraCeramic Air Fryer AF5000 has a capacity of 1250g. How well does it cook fries and crumbed chicken? Snapshot: The DeLonghi Multifry Classic FH1163 has a capacity of 1500g. How well does it cook fries and crumbed chicken? First up, air fryers aren’t fryers. They’re more like a mini-benchtop oven that circulates hot, dry air to produce crispy food in a similar way to an oven in fan-forced mode. Like an oven, food cooked in an air fryer needs to be rotated or shaken to ensure even browning. Air fryers either have a drawer you pull out to shake the food, a paddle that stirs the food throughout the cooking process, or a rotating basket that automatically moves the food inside. Most air fryers do more than just “fry” – they can roast, bake and grill and some are big enough to roast a whole chicken. If you live in a large household and already have an oven, cooktop and grill you probably don’t. You can do as good a job in your oven using little or no oil. They take up quite a bit of space on your bench or in a cupboard. We also measured how much energy each used to cook crumbed chicken for 30 minutes. If used 3 times a week, your energy costs would be $12-30 a year depending on the air fryer. In comparison cooking crumbed chicken in your oven for 30 minutes costs between $12-21 a year depending on your make of oven, although your oven does need preheating. 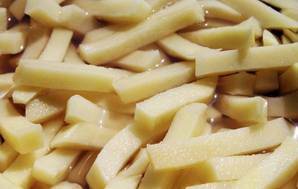 For tasty oven-baked chips, slice chipping potatoes (like Agria) into chips, rinse in cold water, dry, and then coat with a small amount of oil before baking.